Hivos > Uncategorized > Do not wait, innovate! The Disrupt!/Media! 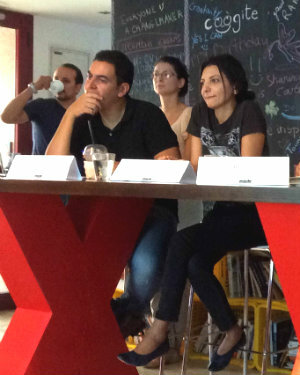 ideathon co-organised by Hivos and the Tunisian coworking space Cogite from 17 to 18 October was an intense – but fun – experience for the 35 participants and everyone involved. This was the second event of the Disrupt Series set up by Hivos’ Mideast Creatives programme to support creative industries in the Middle East. It focused on digital storytelling initiatives. After a pre-Disrupt evening of warm-up games at Cogite, Amine Chouaieb, founder of Chifco and one of Tunisia’s most successful young entrepreneurs, kicked off early Saturday morning talking about the unexpected challenges he had faced. His message? ‘Failure is better than regrets’. The first session was on ideation and brainstorming, designed to get the participants’ ideas – fourteen in total – ready to be analysed in the afternoon. The group later tackled the business model canvas. Here, the professional mentors played a key role, using their expertise to help the teams understand the key concepts of tailoring a business model specific to each idea. Some of the more promising ideas included a publishing house for a new generation of children’s books and media in Tunisia, a transmedia storytelling project on traditions and innovations in Tunisian street food, and an online platform for Arab artists around the region. On Sunday, participants worked to improve their public speaking skills and ability to respond well to questions as well as prepare their five slide maximum pitches with the mentors scattered around Cogite’s unique coworking space. At 15:30 came crunch time. The teams gave their final pitches at random, with each presenter selecting the next one out of a hat. Three main criteria determined the winners: the strength of their idea, the feasibility of their business plan and the quality of their presentation skills. With just 3 minutes allowed, pitches needed to be clear, concise and above all, creative. In addition, each presenter faced three minutes of questioning from the judging panel to see how well they could think on their feet. While the judges made their final deliberations, participants and mentors headed to the famous Latina Café to celebrate a weekend full of new skills, great ideas and budding connections. As one of the participants put it, ‘We can make a positive change by creating’, and that sums up nicely the reason why Hivos supports the enormous creative potential of young people in this region.